Undergraduate and graduate students will compete in the 33rd annual Cal State San Bernardino Research Competition to be held Friday, Feb. 1, in the university’s Santos Manuel Student Union. The competition will feature CSUSB students showcasing their work and research. The students represent five of the university’s colleges: Arts & Letters, Brown College of Business & Public Administration, Education, Natural Sciences, and Social & Behavioral Sciences. Sponsored by the Office of Student Research, the competition gives students the opportunity to develop their presentation and communication skills while displaying their scholarly achievements before a panel of judges, who rank each participant. The competition will be held in the Fourplex of the student union and starts at 9 a.m. The winners of the competition will advance to the statewide CSU Research Competition, this year to be held at Cal State Fullerton on April 26-27, where they will compete against other outstanding scholars in the California State University system. 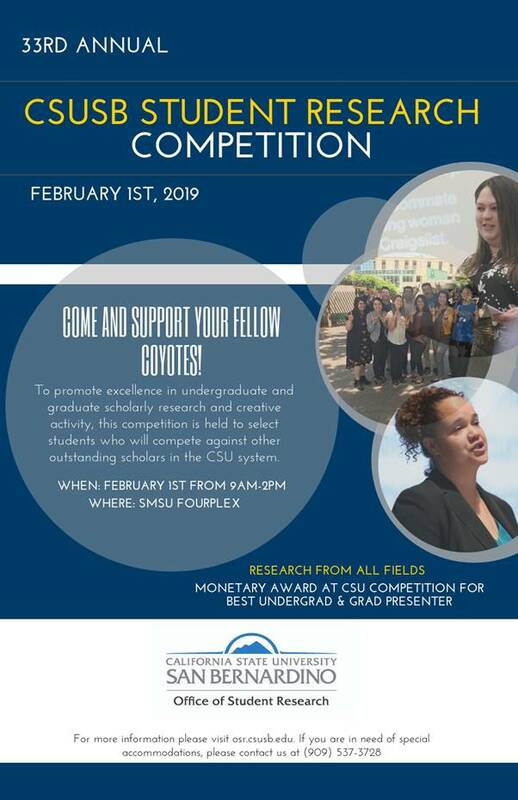 The CSUSB competition is open to undergraduate and graduate students currently enrolled at the university as well as alumni who received their degrees in spring, summer or fall of the previous year if eligible. Presenter’s ability to handle questions from the jury and the general audience. For more information, visit the Office of Student Research Competition website. For more information on Cal State San Bernardino, contact the university’s Office of Strategic Communication at (909) 537-5007 and visit the Inside CSUSB news site.